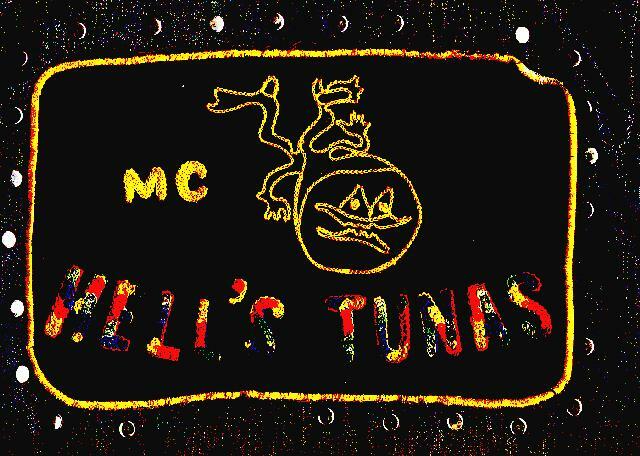 The Official Hell's Tunas colors are the insignia of the Sand Dollar Man (or Great tuna), designed by Paul Klee, and appropriately entitled, "Downwards", embroidered on the back of members jacket, along with the words, "Hell's Tunas M.C.". 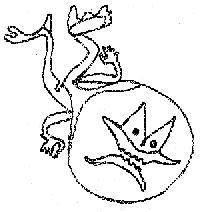 This may be either embroidered directly on the jacket or applied in the form of a patch. Patches are available in regular and child sizes. We are playing fast and loose with the word "available" here, folks. The patch and embroidery work may only be prerformed by Banes Monogram of Lafayette, In., and may only be ordered by a member in good standing of the club. Orders for patches may take anywhere from 6 months to a year to be filled, if not longer. Although she may not be aware of it, Mrs. Banes is a Tuna. There is no question. Recently some heretics asked if another monogram outfit could do the Tuna colors patches. The answer is an obvious, NO! Besides the fact that only Mrs. Banes can do them because she has always done them, and it is a tradition, and she is an institution, etc., etc., there is the fact that Mrs. Banes' embroidery machine is the only one left in the world which can do the magnificant multi-color braided Official Tuna Colors Stitch.